Traditional New England cuisine is justly famous for fresh seafood and down-to-earth ingredients. Seafood (including scallops, oysters and of course clam chowder and fresh boiled lobster), Boston brown bread, and blueberry pancakes with maple syrup, are all on the menu. New England offers a cornucopia of tasty foods. Apizza - A style of Neapolitan pizza that originates from New Haven in Connecticut. It is an irregularly shaped pizza topped with hard cheese and garlic, and sometimes other ingredients. Crab cakes - Patties made from crab meat, breadcrumbs, and seasonings. They are typically fried or broiled. 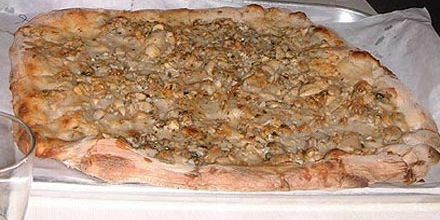 Greek pizza - This style of pizza was introduced to the area by Greek immigrants. It has a thick chewy crust and is baked in a pan in the oven, rather than directly on bricks. Olive oil is used as part of the topping, and sometimes other ingredients from Greek cuisine such as feta cheese, olives, and oregano, are used as well. 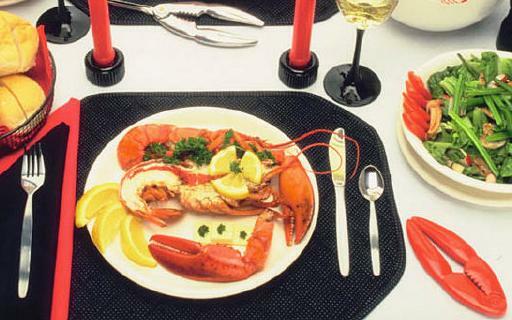 Lobster - New England as a whole, especially Maine, is famous for its lobsters. Lobster roll - Lobster meat with mayonnaise served in a grilled bun. 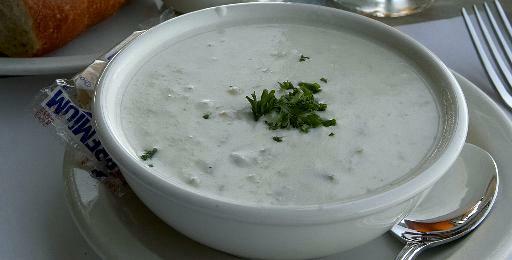 New England clam chowder (also sometimes known as "Boston clam chowder" in other parts of the country) - A soup based on cream or milk. It contains clams, flour, onions, potato, and bacon or salt pork. New England clam chowder (unlike for the example the variety served in New York ("Manhattan clam chowder") never contains tomato - indeed in 1939, Maine's state legislature considered a bill to make illegal to add tomato to clam chowder. Corn chowder - A soup similar to clam chowder, but with corn and bacon replacing the clams. This dish comes from New Hampshire. New England boiled dinner - A meal made from cornbeef, smoked pork sausage, with assorted vegetables such as cabbage, carrot, onion, parsnip, potato, rutabaga, and turnip. 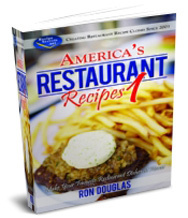 Horseradish sauce, mustard, or vinegar are used as condiments when eating the meal. Indian pudding - A traditional New England dessert. It is made from a base milk, butter and cornmeal, sweetened with molasses, maple syrup, honey or sugar, flavored with spices including cinnamon and ginger, and often has nuts and raisins added. The mixture is slow maked for several hours and then allowed to cool. It is traditionally eaten with hard sauce (a sauce made from butter, sugar, and brandy, rum or whiskey), but nowadays it is quite often eaten with vanilla ice cream.